Here a simple but efficient CFL inverter circuit, capable of diving a CFL, PL or tube light up to 20 watt. You can use this circuit to power up mobile chargers too, while power consumption not exceeding 20 watt. This inverter circuit is powered by a 12 volt lead acid battery, minimum capacity of 5 Ah. This circuit oscillates at much higher frequency than normal AC. So you can’t use this inverter to run AC motors, fans or anything dependent on the frequency of the AC current. The transformer’s primary is made of 10 turns of 24 SWG copper wire, divided into 2 parts, total 20 turns, it’s on the first layer. Secondary is on the second layer, made of around 300 turns 30 SWG copper wire. The feedback winding is made from 6 turns of 30 SWG copper wire, over the secondary coil. The transformer core is a made of two 24mm x 12mm ferrite E cores, there’s around 0.5mm air gap between them. Here another little different CFL inverter, up to 18 watts of output power and running on 12 volt. 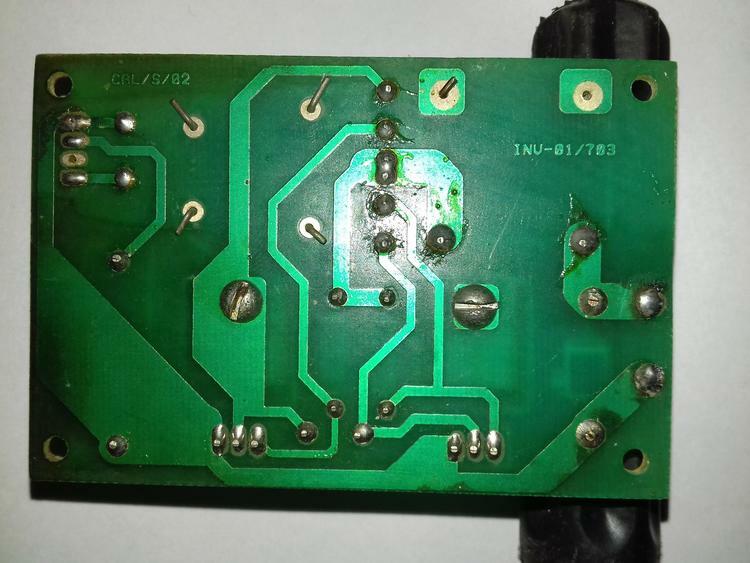 I’ve got this CFL inverter circuit from a solar PL lamp driver, it’s constructed on a 1.6 mm FR-4 PCB, very sturdy design, pictures below. The 1N5408 diode is unnecessary, so you can remove it. You can use this inverter to power a CFL, tube light or PL lamp, up to 20 watt. When you’re planning to power a CFL, connect the A and C points to the CFL’s input. While powering a tube light or PL lamp, connect the input to point A and B.
You’ve to use thick connecting wires from the battery to this CFL inverter circuit, specially for long connections. Because thin connecting wires will cause much more power loss on the DC side. This circuit is basically a high power Royer oscillator. The output is a sine wave, due to the 0.01μF tank capacitor connected to the primary winding. You can read about the working of the circuit here in details. Even there’s a vast research paper on this subject, in case you’re interested, link here. 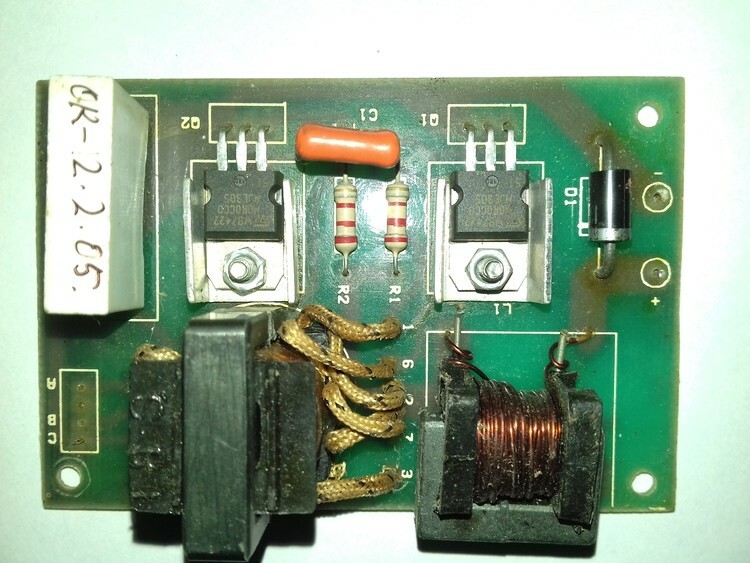 Can i use a EI33 ferrite core transformer from a PC power supply for this inverter, actually i’ve unwound the trafo and kept the parts ready to rewind again. What is the approx. value of L1 in circuit? At what current should L1 be rated at, to avoid unwanted heating when circuit is loaded? What is the function of C2 in circuit? What is the waveform at the output? Thanks for the valuable comment. Of course you can use the transformer core from PC power supply, it doesn’t matter much. 2. It should be able to handle at-least 5 Amp of current. 3. I don’t know it’s exact purpose, I suppose it’s to drive the CFL in AC only, you can remove it, and use point A and C.
4. Output is sine wave. 1. Concerning the L1, the core used in the original circuit is a UU ferrite based, that being a closed path for the magnetizing current, should call for some spacing between the core pieces, is there any spacing between the cores?? Is core saturation possible there if we omit the air gap and join the core pieces without placing a gap? 2. 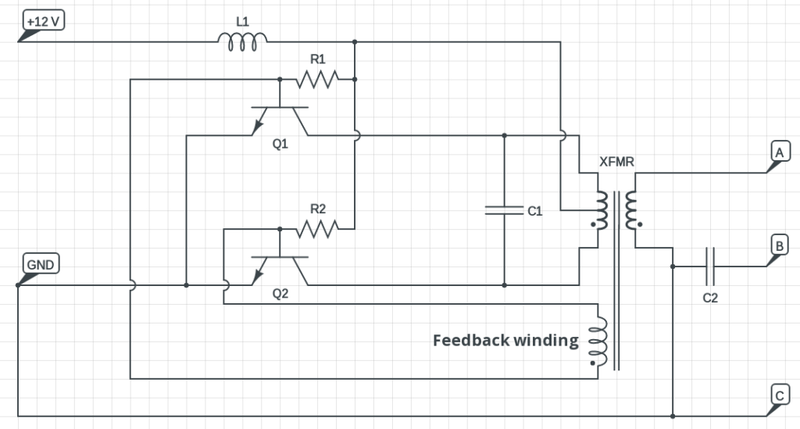 Can a Drum Core or a simple Rod Core ferrite (both being an open path for magnetizing current) be used in place of L1 with the same winding specs work with this circuit? 3. Does L1 and C1 in circuit form the main resonant circuit which results in the transformer outputting a sine wave? Are these the components responsible for giving us the clean waveform at the output. 4. With the given component values, at what frequency is the circuit oscillating at(on an approx)? 1. There’s no air gap between the U cores, saturation of L1 doesn’t matter much, you just need to put enough inductance to ensure current mode operation. 2. You can use inductor of any shape, I’ve seen some many models with ferrite rod as the core of L1, like this, https://www.circuitsdiy.com/cfl-emergency-kit-push-pull-application-12volt-18watt/ . 3. No, it’s not L1 and C1, the tank is C1 and the combined inductance of both halves of the primary winding. 4. It’s pretty difficult to determine the actual operational frequency just by calculating the resonant frequency of C1 and the combined inductance. It’s different under different supply volatge, load condition, temperature etc. etc, but close to the resonant frequency. This circuit is perfectly correct. I’ve built this circuit using the EI33 ferrite core as described earlier. The core being an EI meaning—one E and I piece to complete the magnetizing path. Here the path is closed and there is no leakage of magnetizing flux lines in the air. The vertical leg of the center ‘E’ piece was originally cut a bit shorter than the outer leg pieces. After placing the ‘I’ piece on the ‘E’ and hooking it to a light source, i’ve found the necessary air gap in the core. This was a benefit since i didn’t have to make any spacing between core pieces while building the new transformer. Based on the newer ferrite designs, manufacturers offer the spacing to the core when it is made in the factory itself. This is an added advantage. This reduces the time and thinking going behind deciding about putting spacing between the core for persons building the transformer. The one in your circuit being an EE core is also a closed magnetizing path of which the transformer can operate efficiently. Being a sine wave oscillator, the transformer is silent(provided the core pieces are fixed properly with tape) and high frequency AC is best to drive fluorescent tubes. I used a 2-foot standard 18W Philips tube and it worked at full brightness. But I changed the winding details and used a different core. I’m ready to share the data after i dismantle the whole thing. I’m really thankful to you for sharing the circuit…..THUMBS UP!!! I also look forward to help others making this circuit…..once again THANKS. The Capacitor C2 seems to be important, I’ve found this out only after purchasing a second hand rechargeable emergency lantern (Philips make) which had a single 18W TL/D 2-foot tube. It had a battery rated at 6V @ 4.5Ah of SUNCA brand. The battery was completely dead. I purchased a replacement battery of the same specs and soldered it back to the place of the original one. For a sec or two the lantern gave a fine humming sound and the tube lit up brightly within a couple of seconds. C2 is actually a HF stabilization capacitor which equalizes the glow between both ends. I omit the capacitor and connected the tube directly to the transformer and switched on the circuit, the tube was glowing but brightness was not equalizing at one end of tube. So C2 seems important!!! I can say this with confidence. Thanks ! It’s a very good to know the purpose of C2 in this circuit. Thank you again ! Can you make the circuit for 80W lamp? OR TRIANGULAR OR SAWTOOTH). BUT NOT SINE WAVE. IT PCB WILL HAVE PROPER IN AND OUT MARKING AND WIRES. PLEASE HELP ME IN THIS REGARD AND LET ME KNOW YOUR CHARGES. INITIALLY I WILL REQUIRE 5 ASSEMBLIES. OUT PUT SIGNALLING WILL BE A SPEAKER OR LED. Remove the C1 capacitor, the output will be square wave. As far as I was aware, a Royer oscillator used a saturating core transformer. This circuit should not and does not need to, therefore I would not class it as a Royer. It is not just the capacitor that makes it a sinewave. The series inductor is the key difference which allows the transistors to switch in square wave while producing a sinewave output. This allows the circuit to operate with high efficiency. The inductor needs an air gap to avoid saturation. The transformer might also need one too, as the circulating currents in the resonating LC stage, which as your correspondent noted produces the sinewave, can be quite large. To produce a square wave you need to remove the inductor too. It is not just the capacitor that makes it a sinewave. The series inductor is the key difference which allows the transistors to switch in square wave while producing a sinewave output. This allows the circuit to operate with high efficiency. The inductor needs an air gap to avoid saturation. If you use an open ended ferrite, that will have an inherently high air gap. The transformer might also need one too, as the circulating currents in the resonating LC stage, which as your correspondent noted produces the sinewave, can be quite large. To produce a square wave you need to remove the inductor too.